This isn't what I had planned on writing about for this week's post, but my thoughts won't be silenced until I write them down. And since I have to go to work in the morning, I really want to get some sleep and I can't do that with my mind full of words. 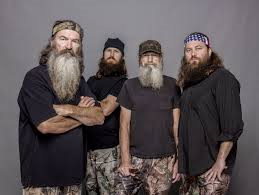 By now I think most people have heard about the controversy surrounding Phil Robertson of Duck Dynasty. If you haven't, just open a Facebook account or surf the internet for about five seconds. You will hear plenty about this GQ article. Since this blog is mostly about writing I want to talk about the article itself. The first thing that struck me about this article is that it was written in the first person narrative POV which is often reserved for short stories, novels, or memoirs. By writing it this way, the reader is seeing everything through the author's eyes, thus making the author the main character of this article. Which is strange if the article is supposed to be about the founder of Duck Commander, but writing is all about trying different perspectives to tell a story. As I read the article I realized it was a story he was telling. Not that I'm saying it was fictional, I'm saying the author wanted to take the reader on a journey, making sure the reader experienced what he wanted the reader to experience. He did this with expert precision. He starts out talking about the setting, the supporting character (Phil), and the background information. Once he gets that out of the way he goes right into shocking the audience with statements from the supporting character and painting those comments in such a way that the reader should feel offended. He continues to do this alternating from criticizing the supporting characters and praising them in the same sentence. But even as he praises them he makes sure the reader is looking down on them and their backward notions. Now I want to take a step back and recognize that some of the statements made by the supporting character were crude. But I remember when Golden Girls first came out on TV and how it was suddenly funny to watch old people say crude things. Why? Because they wrote it that way. If this had been a sitcom, the whole audience would have laughed at Phil Roberson's crude comments. Why? Because it would have been written to be funny. Thus the power of the pen. The author is in control. What was the author of the GQ article trying to accomplish? Did he mean for it go as far as it did? Maybe he was just trying to sell magazines. Maybe he really was offended. I don't know. But I do know that he used his words in a deliberate manner to invoke specific feelings and reactions. Because that's what we do as writers. I'm not going to comment on the controversy from the article because I honestly believe God will sort everything out in the end, so why should I spend my time stressing out over who's wrong and who's right? That's not my call. All I can control is myself and what I write. So my question to you as writers is how will you use the power of the pen? Will you do whatever it takes to sell books? Will you deliberately use your words to incite controversy? Will you use your words to divide people and point out differences? Will you manipulate your audiences to feel offended or other strong feelings to get strong reactions? Or will you use your words to tell stories that will inspire, uplift, and unite people? The power is in your hands, it is your responsibility to use this power wisely. Very, very well said, Nikki. Perfect. Thanks for this, Nikki. I truly believe that this whole thing was orchestrated to garner publicity- the people who put out magazines and the top dogs at TV networks aren’t naive. They knew where he stood on that subject and they knew that by pulling it out of him and showcasing it they could start a firestorm on social media, and they succeeded. This is something important to remember when reading blog posts and other things that are controversial- I believe that probably more than half of these things you find on the net are written for the sole purpose of generating talk, regardless of how intense and inflammatory that talk gets. More talk = more publicity and more publicity = more website hits = more $$$. The media has turned into the schoolyard kids yelling “Fight! Fight! Fight! Fight!” and selling tickets to the brawl. Sad, but true. Thanks for reminding us of the power of words! I agree with Kasey. It was no surprise to A and E that Robertson holds the views he does. They knew what they were getting when they created the show. GQ was looking to start a controversy, and it worked. I, too, thought the author had a bit of an agenda. I happen to like Duck Dynasty. It's a crazy, fun show, and I think all this has backfired on the network.